Where can you seek solace from the summer sun beneath century-old structures, a rainbow of color from breathtaking foliage in the fall, a serene snowy landscape in the winter, and a bounty of blossoms in the spring? Florence, of course, at the historic Boboli Gardens! A beautiful walkway in the Boboli Gardens with stunning foliage and impressive sculptures on both sides. Beginning in the 15th century and growing until the 19th century, it’s received contributions from Italy’s most influential families such as the Borgolo, Medici, and Lorraine families. It’s also the inspiration for the royal gardens in Versailles. Here, you’ll find much more to explore and behold than foliage. The Boboli Gardens host an amphitheater shaped like a partial ancient hippodrome theater, with an authentic Egyptian Obelisk brought from Luxor in 1789. Various fountains and sculptures can be found throughout the grounds, such as the elegant “artichoke fountain” and “Neptune’s fountain”, where a sculpture of Nepture boldly wields his trident. As visitors approach the Porta Romana, they will find the “Viottolone” which is an avenue leading to an open space and surrounded by statues and giant cypress. The open space features the “Ocean” fountain, and other classic sculptures symbolizing Roman deities and ancient wonders. The most recent additions beyond the Obelisk include the “Kaffehaus” and the “Lemon House” constructed in the mid-1770s by the Lorraine family. Although the gardens feature sculptures, architecture, and other artistic creations from various centuries, it all fit together beautifully to construct one of Italy’s most historic and reveled museum. There’s no debating Florence is a hub of art and architecture, so it’s no wonder it’s the home of the Boboli Gardens. Known as the birthplace of the renaissance, even after a full day of exploration in the gardens, there’s plenty more to see! Florence is a must-see for visitors to Italy. 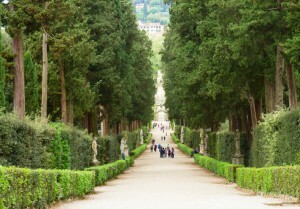 Travel to Florence and see the Boboli Gardens in person! AESU offers several trips to Italy, including: Cosmopolitan, Explorer, Euro Focus, Great Escape, Viva Italia, and Euro Spree. Explore Italy and its ancient architecture, plus see Florence and admire its breathtaking gardens. This entry was posted on Thursday, March 10th, 2016	at 11:00 am	. You can follow any responses to this entry through the RSS 2.0	feed. Both comments and pings are currently closed.